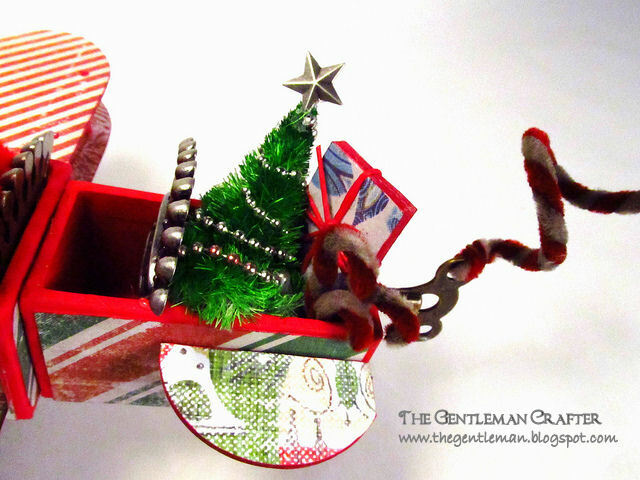 The Gentleman Crafter: Inspiration Emporium's December Challenge-Done! I sure do appreciate your A-M-A-Z-I-N-G birthday wishes! You all are so incredible and I thank you. I had THE MOST AMAZING DAY! Thank you so much for making it even more special! Well, It's December 2nd and the crunch is about to begin! (it already has really!) CHA Samples! Tons of them! I love it! Stressful, but I love it! I finally wrote down what was in my head and made a list of all the things I would like to create and I honestly can't wait to see what they look like. The reason I'm writing this is to explain if my blog post are a bit more spotty than normal, I'm crafting away trying to use all the newest stuff in ways that will be cool for January's show! Well see how it goes....LOL! It truly was one of those projects that I just had fun making and could't stop! I hope you like it! THANKS FOR COMING BY AND THANK YOU AGAIN FOR THE INCREDIBLE BIRTHDAY WISHES!!! Love you plane! Gotta make it to remember the day I soloed!!! Is there any Ideology stuff left in the stores? LOL...great project! Absolutely STUNNING heARTistry Sir Jim! What a cheerful piece to share with us all for the Holidays. Thank you so very much. Love how you shared your creative process. I think I'm going to utilize my sketch book too. Your so motivationally inspiring! My dad would have loved this flying Santa. I just may have to make it in his honor. He flew RC airplanes for years and I still have some of them. Which just put on a light bulb! I could use one of his airplane bodies and make something altered out of it. I was holding on to them for my nephew (my brother is deceased too), but he doesn't seem to be interested in them. So why not? Thanks so much for the inspiration and thanks as always for sharing. My jaw hit the floor when I saw this..what a wonderful project! This is absolutely adorable Jim. Happy belated Birthday. Santa looks as if he is truly enjoying making his rounds in this joyful project. Your workshop sounds as if it will be humming like Santa's. Hummm, Jim the Gentleman Elf does have a nice ring for December. Belated Birthday wishes for a joy filled year. There truly is not enough words in the English language to descibe how sheer talented you are. The plane is just of the park. Jim, you are BRILLIANT! I LOVE everything you create and you have to be the sweetest and one of the most inspirational guys around. Happy belated birthday! 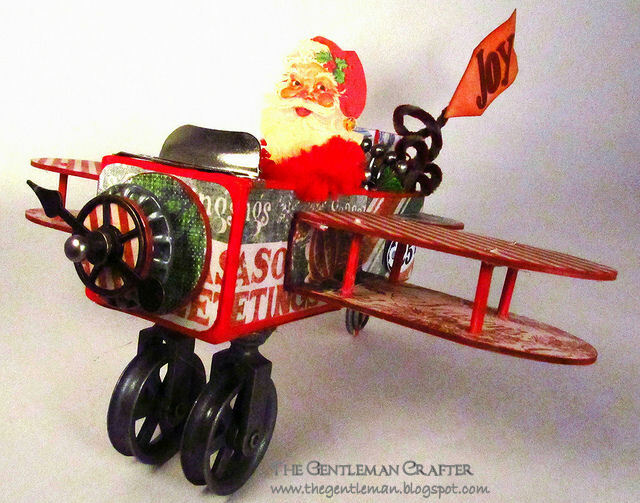 Love the vintage looking Santa decoration Jim, SPECTACULAR!!! Wow its great - my Dad would love this! this airplane is really, really fab. Love it love it love it! Tim shared it on FB and of course I had to head over here to tell you how much I like it. I had to get #2 son the Lego Sopwith Camel for his 37th birthday.Need I say more-game on here.Thank you so much for this perfect inspiration. WOW! Newbie coming over from Tim's facebook shoutout...this is AWESOME!!!! Stinkin' cute! I love it! How great would this be on top of the tree? Your imagination truly knows no bounds! Oh My Goodness Gracious Jim!! That might be the coolest thing I have seen in awhile. My Dad loves planes and I had NO idea what to do for him for Christmas and you just solved it for me. I could just kiss your top hat! Thanks so much for this project! You are truely amazing! LOVE this! Just amazing and so fun! Oh, and happy birthday too! You did a bang-up job of incorporating the meaning of 'joy' in the whole project. How fun is this! Vry clever how you diecut the wing-shape from Tim's houses die.Taking notes here.Thanks for the idea for a gift for the fellas too.Good luck with all your CHA projects. I'm patiently waiting til you can share them with us. :)I can certainly survive with less blogs for a bit. I want to be sure you enjoy this as it's happening and for Pete's sake, don't wear out your imaginator. You just can't help but smile looking at this adorable project! Jim, you are awesome! WOW, I don't know what to say, it's AMAZING!!!!! I'm sure Tim is proud, he's lucky to have you on his team. I can't wait to see what you come up with for CHA. Thanks Jim again for sharing your talent with us. 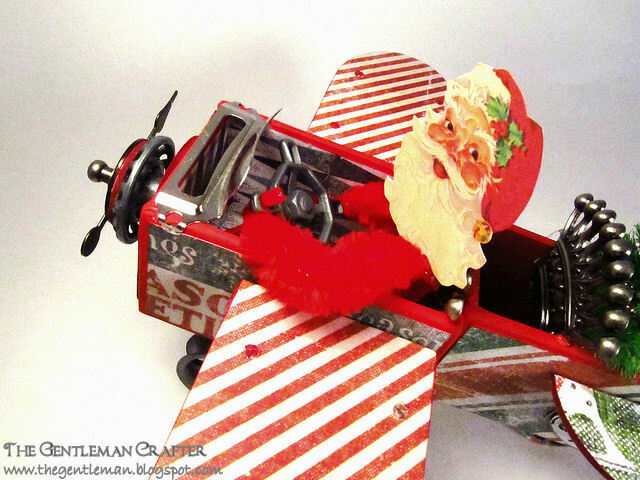 The Santa in the plane looks like he's having the time of his life...and why wouldn't he...his plane is SPECTACULAR!!!! You really "flew" one out of the park with this fun creation!! Do you ever sleep? this is yet another wonderful creation. LOVE it. Sorry to be so loud, but I do!!!! Outstanding Jim! A-maz-ing details. Love the label pull as the wind screen and pulleys as wheels. So festive and joyful! My Dad was a pilot so this brings back great memories for me. Thank You. First of all Happy Belated Birthday! This plane is absolutely awesome. I know you will be busy with all your CHA projects,but please dont forget us. Wow!!! Fantastic!!! Incredible!!! Love it!!! Very joyful indeed. This is right up my alley! I love making 3d things at Christmas time. I actually have out my pipecleaners, vintage heads & doo-dahs, crepe paper waiting to be made into something.....and here is my inspiration. Thanks Jim for another great idea! Don't forget to take time to enjoy the season. So, you show up to a party with paper scraps stuck to your head or you are covered in glitter (or dye) your true friends won't judge you, they will just love you. Love how your imagination works. This piece is amazing with all the TH pieces. Discovering each separate piece was fun and put a smile on my face. Nothing could be better!!! AMAZING!!! ABSOLUTELY AMAZING!!! Yep. It's definitely a keeper. Great job, birthday boy!!! Cute, Cute, Cute incredibly too cute! Such a gifted and talented man. Love they plane. A very happy belated birthday to you as well. Sigh..imagination indeed! You never cease to amaze and inspire me, Jim! Just what you do with those configuration boxes makes me think of new things to try with them myself! Thanks for sharing your creative genius in such wonderful ways! Like it??? It's sensational! Oh, I wish there was just a smidgen of your creativity in my feeble little brain. How do you do it? You are AMAZING!! Wow! 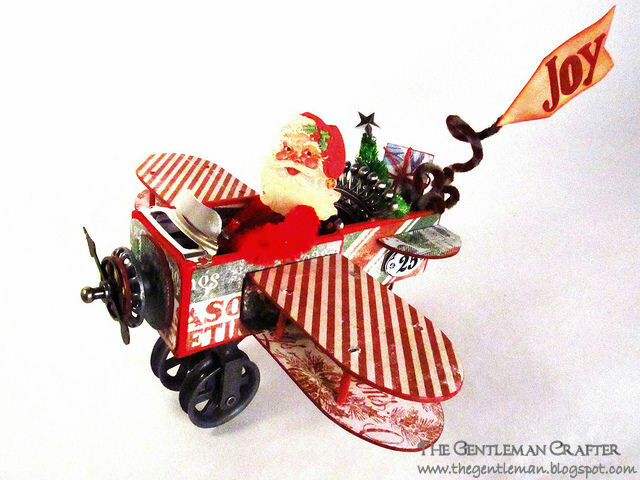 It looks like all those Tim Holtz items were designed with a plane in mind! They work perfectly for your creation. I love waking up here in Oz to your posts each morning. It is a wonderful way to start the day. This is stinkin amazing - what a wonderful use for additional configurations boxes - your imagination knows no bounds! Holy Santa Claus! Who needs reindeers. Too darn cool! This is brilliant. I want one!! Pretty please? This plane is adorable and I love it!! Where do you come up with these ideas?? You're a genius! You have the most amazing ideas for 3 dimensional items, it blows my mind. You should be selling box sets of the products someone would need to make all of these awesome projects. Include directions and what not and you could make some good money that way, I know they'd sell like hot cakes. Fabulous, just amazing....I am in awe of you. HOW AMAZINGLY ADORABLE IS THIS JIM???????? ?I absolutely love it!!!!!!!! What a wonderful, most inspiring little plane! I love stickling for details, too - it's so exciting to add matching items here and there and to see, how it's going to grow. Love it - you did a great job!